The universe is expanding at an accelerating rate, and we don't know why. Dark energy is needed to explain this, but what is this strange phenomenon? We don't know, but NASA has conclusively ruled out an alternative to dark energy. Based on our current theoretical understanding, the universe should eventually stop expanding and, thanks to the gravitational attraction between all the mass in the universe, eventually condense back again into what's been called the Big Crunch. But that's exactly what's not happening when we observe large-scale phenomena such as certain supernova explosions, which indicated the expansion was actually accelerating. There must be some otherwise unknown and undetectable repulsive force that's greater than the attractive force of gravity. That, essentially, is what dark energy is, although obviously there's a ton of details regarding its nature that we still don't understand. But now we can at least say this - whatever dark energy actually is, it looks like we're stuck with it, as a leading alternative to the dark energy hypothesis has been ruled out by NASA's Hubble Telescope. Specifically, the opposing idea was that our galactic neighborhood is surrounded by a vast void of unusually empty space some eight billion light-years across. If we happened to be at the center of this void, then the apparent acceleration of our neighboring galaxies away from each other would just be an illusion created by our unusual position. It's not a terribly elegant theory, but physics doesn't necessarily demand an idea be elegant for it to be true. But data from the Hubble Space Telescope has now allowed astronomers to greatly refine our understanding of the universe's expansion rate. We've reduced the margin of error from about 30% in 2009 to just 3.3% after these new results. What's more, the researchers were able to measure the redshift of supernovas even further away than ever before, offering conclusive proof that the accelerating expansion isn't an illusion created by our particular position in the cosmos. We now can say with even greater accuracy than ever before that the expansion rate of the universe is 73.8 kilometers per second per megaparsec. A parsec is equivalent to about 3.26 light-years, so this means that for ever 3.26 million light-years a galaxy is from Earth, it appears to be moving away from us 73.8 kilometers per second faster than it would if it was right next to us. This far greater certainty allows physicists to place tighter constraints on the actual strength of dark energy, and it helps narrow down the possibilities as to what it actually is. It also offers insight into the universe's shape and the nature of the universe's various neutrinos, the barely interacting particles that filled the early universe. 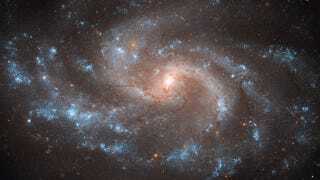 For more on the methods behind this discovery check out NASA's HubbleSite. For more on dark energy, check out Dr. Dave Goldberg's earlier piece on the subject. Original paper in the Astrophysical Journal.